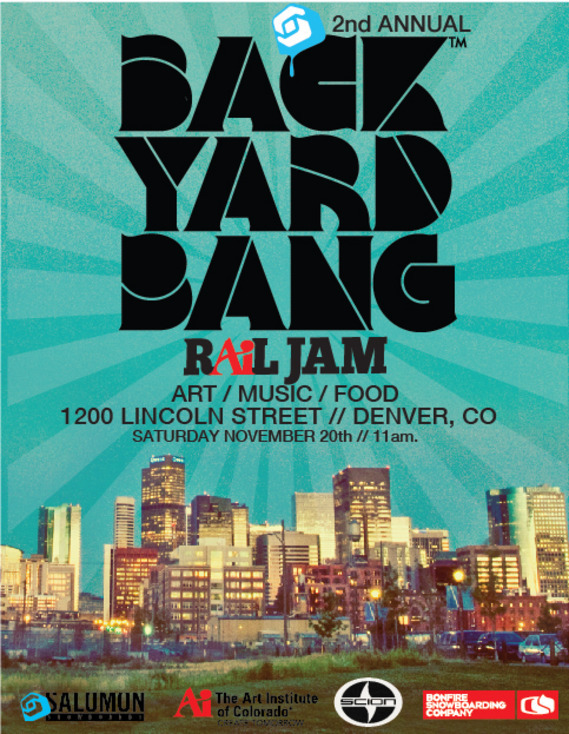 Don’t miss today’s (Saturday, November 20th) Backyard Bang Rail Jam in downtown Denver at the Art Institute of Colorado at noon. It’s going to be a full day of snowboarding with a party afterwards to raise money for a good cause. First place prize for men will be $1500 and the first place prize for women will be $1000. Riders are traveling from throughout the US to compete against Colorado’s finest. The event is open to the public at no charge and will include food, refreshments and a wide range of entertainment options. Interactive games, giveaways, autograph signing with pro riders and a DJ booth will all be a part of the day’s activities. The rail jam is a good chance to meet Salomon pro riders Jed Anderson, Chris Grenier, Louif Paradis, Bode Merrill, Desiree Melancon, Scotty Arnold and more in addition to kicking off the start of the season. Afterwards there will be an official after party at City Hall. The evening will help raise money for the Snowboard Outreach Society. It’s 21+ and $10 at the door. If you’re looking for some fun downtown, make sure you stop by. Learn more at the Salomon Snowboards blog.